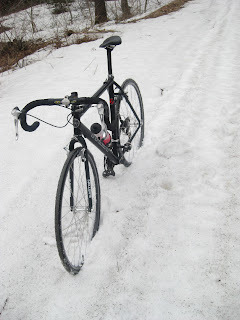 I like winter, but will freely admit I look forward to getting back on my bike when the snow melts. This spring was college tour time for daughter and JNT skier Caitlin, thus I found myself visiting a college near Mt.Graylock, in western MA. These tours were providing a good opportunity to “double-up”, college tour in the morning; bike ride in the afternoon. Misjudgements tend to be a prelude to misadventure, and that proved the case when I figured the best ride here would be up Mt. Graylock, the highest point in MA. The map suggested a route switchbacking up from the north, a short spur to the summit followed by a decent to the south and a return route up a valley west of the mountain. At the start for the climb, things couldn’t be better, turns out the road to the summit was closed, so after slipping around the gate we were on a trafficless road with superb views. After climbing for a while, we hit some snow and after a bit had a problem. The road was covered with small patches of snow and we had been walking the bikes across assuming things would improve as we got nearer the open summit. Naturally this wasn’t the case, the snow was getting deeper, I think the pictures best describe the situation. Ultimately, the question was really getting to be, “what was the fastest way down?”, back through the snow, or hope the road on the south side of the mountain, which the map indicated was relatively close, was clear. We opted to push over the summit and take the southern route, and I will never know if that was the better decision. We made it back to the car, five hours after the start of the ride and having spent the last hour riding in the dark. Sound judgement and good planning ruled for my real summer holiday, canoe tripping in the LaVerendrye Wilderness Reserve in Quebec. I don’t think Goldilocks could find a better place for tripping, the lakes: not too big, not too small, the rapids, not dull but not too scary, and the navigational challenges…. just right. Combine that with great weather offering blue skies, brilliant stars, sandy beaches, plus generations of family: all ingredients for a great trip.